This LEED® Silver-certified boasts forward-thinking design reflecting its vibrant setting. 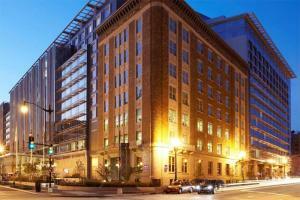 Just blocks from the National Mall and Smithsonian Museums, this hotel places you in city's vibrant heart. 1,175 rooms and 49 spacious suites feature flat-screen TVs and plush bedding. Many rooms feature expansive views of the city. The hotel features a bi-level fitness center and six restaurants. Located just north of the National Museum of Women in the Arts.